creates since 1979 performances relating dance to other media. After a classical dance education in Düsseldorf, she studied acting and singing in Berlin and enrolled in a contemporary dance education in NYC at the Merce Cunningham School of Dance. She studied with many protagonists of the NYC postmodern dance scene. Qualified by her visual arts major, she participated in projects of the Academy of Fine Arts Düsseldorf and Academy for Film and Television in Berlin and developed her own crossmedia art form. Dancer with PLAN K/ Frédéric Flamand in Brussels, Belgium. In 1989, together with actor and performance artist Reinhard Gerum, she founded the group “Britta Lieberknecht & Technicians”. Based in Cologne, Germany, since 1992, they produced more than 25 dance performance pieces. She is co-choreographer and co-director of the “Theater Monteure” performing for young audiences, and won in 2006 the Cologne Dance Theater Award and, in 2007, the Cologne Award for Theatre for Children and Young People. She continuously collaborated with musicians, mostly staging live musicians as interacting performance partners, especially trombonist Paul Hubweber, jazz drummer Christoph Hillmann and violinist Toshiko Takada. In 2013, she founded „Britta Lieberknecht & Company“ consisting of five young dancers. Pianist Laurenz Gemmer collaborates to shape the musical character of the dancing. Focus of the company is the interpretation of classical and contemporary music. 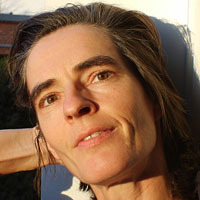 Since 1981 Britta Lieberknecht develops teaching dance related to gravity, to the voice, to repertory from Trisha Brown, to emotions and to neurophysiological patterns. Into her teaching she integrated the knowledge gained from her education and practise as physiotherapist from 1996- 2003.